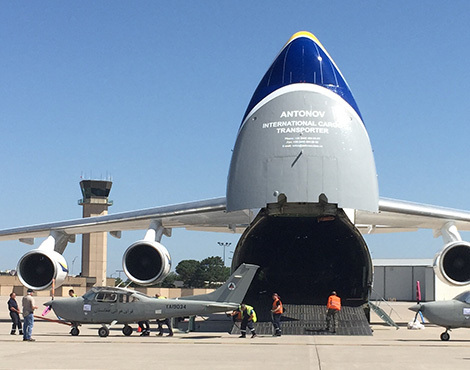 Offering a rare combination of project cargo expertise, industry connections and unparalleled dedication to customer service, AIT’s aerospace logistics division can provide you with a service plan of action to move your aviation material from point of origin to destination. Our team of experts handled the delivery of a 16,000 pound CF6-80 aircraft engine from Atlanta to China and orchestrated the safe return of six single-engine aircraft from the war-torn country of Afghanistan to Wichita, Kansas via charter. Our highly specialized operations professionals are dedicated to proactively managing all varieties of oversized shipments, not limited to aircraft engines, from pick up to delivery and everything in between. We understand that time is critical in the aviation industry. Supported by a robust global network, AIT provides aircraft-on-ground shipping solutions customized to your needs. At AIT, we know we only succeed when our customers succeed, and we are fully dedicated to making your supply chain simple, efficient and cost-effective. For more information about AIT’s aircraft engine transportation expertise, view our Aerospace List of Services or contact one of our AIT representatives.